He was the quarterback of the future for the Texas Longhorns and he’d just smashed Vince Young’s single-game school record with 527 total yards against California. He could throw. He could run. He could do just about everything. Then all that juice dried up with a whole lot of losing. A fifth-year senior, Heard heads into his final home game this week against No. 18 Iowa State (6-3, 5-2 Big 12) as a fifth-option wide receiver and special teams guy for the No. 13 Longhorns (7-3, 5-2). But he’s still got the record. And he’s earned a whole lot of respect from his teammates for stepping up with a career-high six catches last week against Texas Tech. One of them came in the game-winning touchdown drive. Heard’s career was supposed to be more than that. On Tuesday, he looked back at what it became and still smiled at the experience. One of the top-rated dual-threat quarterbacks in the nation coming out of high school, Heard was recruited by Mack Brown and stuck with the Longhorns after Brown was fired and Charlie Strong came in. After redshirting for a year while fans called for him to play during a 6-7 season, Strong finally gave him the keys to the offense the second game of 2015. He won his first start against Rice, then broke Young’s hallowed record which had been set in the classic 2006 Rose Bowl win over Southern California. But even that was tainted just a bit. Heard scored three times against California, his last one a 45-yard sprint through the middle of the field for what should have been the game-tying touchdown. But kicker Nick Rose missed the extra point. Heard’s biggest day as a Longhorn ended as a loss. Heard had at least pumped some life into the Texas offense. Until two weeks later when Texas got smashed 50-7 at TCU. Even after an upset win over Oklahoma, Texas got shut out at Iowa State. Heard started 10 games at quarterback and Texas finished 5-7. He finished the season on the bench with concussions symptoms. His days as a quarterback were done. 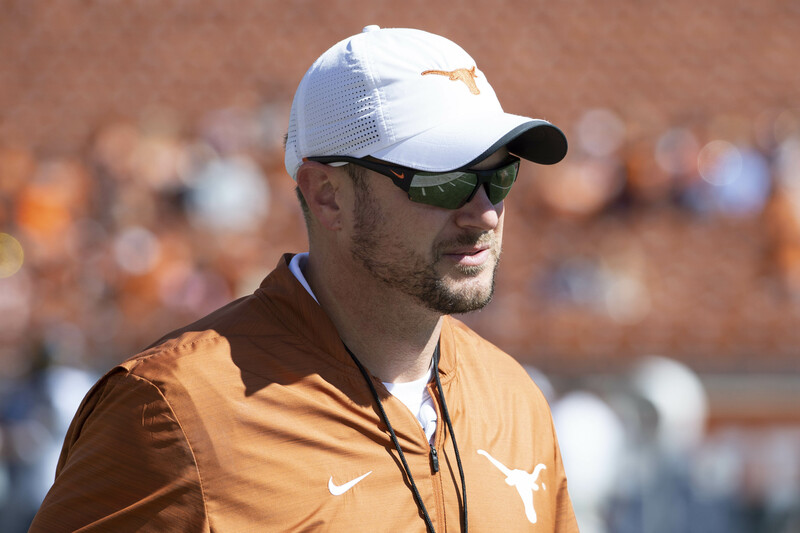 By spring 2016, Strong had revamped his offense and brought in quarterback Shane Buechele. After sitting out that spring with a shoulder injury, Heard was no longer part of the quarterback competition and moved to wide receiver. Heard probably could have transferred to play quarterback elsewhere. He wasn’t that far removed from a stellar high school career that could have landed him just about anywhere. He never considered it. Heard wanted to stay at Texas and wanted to win games. He was willing to do it from different positions. Heard’s first season at wide receiver was his best when he caught 24 passes and tied for the team lead with three touchdown receptions. But his role kept diminishing as the Texas offense got better. Until last Saturday, he’d caught just three passes for 29 yards this season. 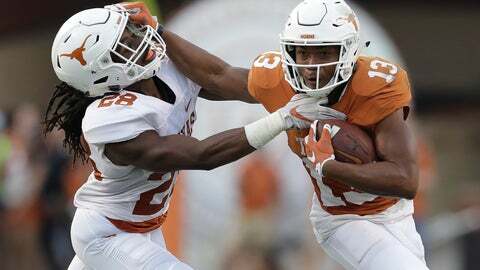 He was thrust into a big role against Texas Tech because of an ankle injury to Collin Johnson, who has 50 catches for 675 yards and five touchdowns. “He was our offensive MVP for the way that he played,” coach Tom Herman said. Herman has made sure to keep Heard as a big presence in the locker room, putting him on the team’s leadership council. No player has likely felt the highs and lows of a career like he has. The journey of his career has prepared him for challenges beyond football, Heard said. “When life brings hardship, I feel very confident in myself (that) I can adjust to it and make it happen,” Heard said. Heard has already earned his degree. And he’s still got that record over Vince Young. “That’s a cool thing, to always have that history,” Heard said.